Defending champion Ando’s Mac will meet a familiar foe when he lines up in a heat of the TAB Melbourne Cup this Friday night. Now in the care of Anthony Azzopardi after winning the 2016 edition under the tutelage of Jason Mackay, Ando’s Mac will meet last year’s runner up Jesaulenko in one of the most anticipated match ups on a stellar evening of greyhound racing. Also in that heat (race 8) is group 1 Topgun winner Up Hill Jill, highlighting the depth of quality of the $600,000 series. Eleven group 1 winners will greet the starter bidding for a place in the Cup heats including dual group 1 winner Lightning Frank, reigning Victoria Sprinter of the Year Striker Light, National Sprint Champion Jury and last start Vic Peters winner Crash Bandicoot. Robert Britton is aiming to break his TAB Melbourne Cup hoodoo with seven starters, while Seona Thompson will prepare a team of six, including three of the favourites in the TAB market in Aston Dee Bee ($9), Bewildering ($9) and Big Flood ($12). In addition to eight TAB Melbourne Cup heats, four heats of the group 1 Bold Trease for stayers will be run. 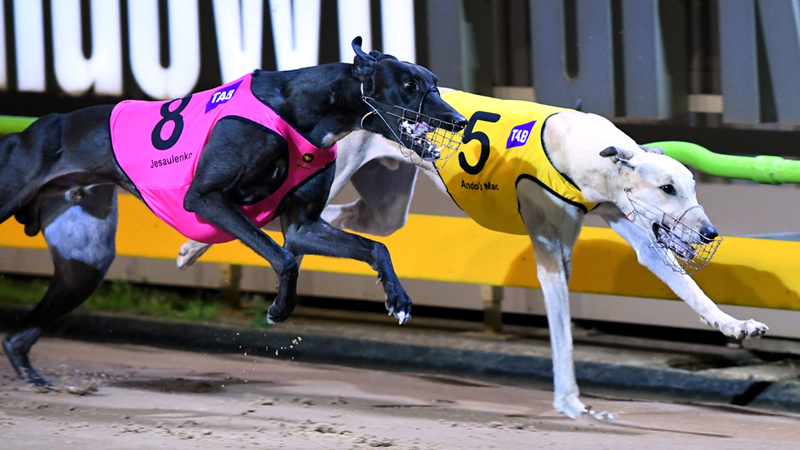 Six time group 1 winner Fanta Bale has opened the even money favourite for the series as she continues her quest to become the third greyhound to pass one million dollars in prize money. She enters the series with $986,170 in prize money, meaning she need only run a place in the $145,000 final to join Fernando Bale and Dyna Double one in the million dollar club. Topgun Stayers winner Bogie Bekim, last start group 1 Hume Cup winner Rockoon, and veteran Australian and now New Zealand stayer Ring The Bell will also take their place in the heats. Heats night will feature runners from every mainland state as well as New Zealand, which will see Bigtime Paddy attempt to become the first greyhound from across the ditch to claim the world’s richest races since Kwik Metal claimed the race in 1974. Widely regarded as the finest night of chasing on the calendar, the 96 greyhounds drawn into the 12 group 1 heats have combined to win 1267 races and over $10.6m in prize money. TAB is projecting $20,000 First Four pools on each race on Friday night! Click here for your free form guide for Friday night’s heats. * NOTE: Original fields featured an ineligible reserve greyhound ‘Dyna Dean’ being drawn as a Reserve in Race 8, this greyhound is to be replaced with the greyhound ‘Dyna Fabrice’. No redraw of boxes in accordance with GAR 22(7) is required.